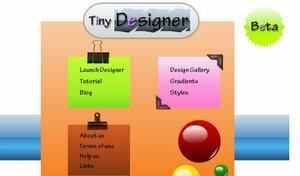 TinyDesigner – Web 2.0 interface style web sites are becoming more popular and appealing these days. There are lack of FREE/Online tools to create such appealing web 2.0 graphic designs. Tiny Designer fills this gap by providing a FREE Rich Internet application, which can enable designers to create web 2.0 style vector graphics designs in no time. To prove that this tool works effective, The graphics in the entire www.tinydesigner.com site is designed with Tiny Designer application alone. Save / Open design projects. The showcase of designs and presets are available in http://blog.tinydesigner.com, and to start using the application simply go to www.tinydesigner.com/TinyDesigner.html.